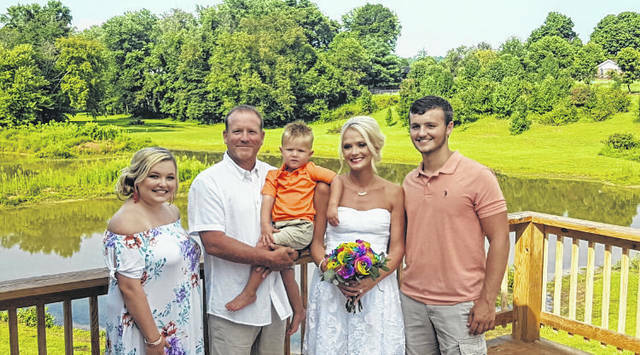 Pictured is the Nott family on Kevin and Nicole’s wedding day, pictured along with Kevin and Nicole are Carly, Cameron, and Cain. POINT PLEASANT — When residents within this community are facing hardships, the rest of the community comes together to help in anyway they can. Kevin Nott, of the WBYG Radio Station and voice for the Point Pleasant Big Blacks football, has been in the hospital for almost six months and is currently back at The Ohio State University where he had undergone a serious surgery at the beginning of this long road, facing complications on the way. “He has been through so much. He has a long way to go. We are just thankful and blessed he is still here with us,” said Nicole Nott, Kevin’s wife. To help Nott’s family with medical and travel expenses, members of the Bellemead United Methodist Church along with assistance from area churches and other area volunteers have organized a benefit spaghetti dinner and auction. The event is set for Sunday, April 7 at the Point Pleasant Junior/Senior High School (PPJ/SHS) Commons Area from 11 a.m. – 2 p.m. The meals are either dine in or carryout, $8 per person for ages 12 and up, and donation for those under 12 years of age. Though Nicole is exhausted as she has not wavered in staying by her husband’s side, she continues to get strength from God daily, she said. For more information on this benefit event or to volunteer, call 304-675-5886, to donate craft and auction items, call 304-675-5334.